Named after British prime minister-factory Eton College where it was first invented by students in the 17th century, Eton Fives is a sport played between two doubles on a three-sided court. Unsurprisingly, it is always best of five games (down from seven since 1894). The sport was imported to Cambridge in the 1920s. First played against the bays and buttresses along the side of the majestic Eton chapel (where the ‘beaks’ must have forgotten to hang a “no ball games” sign), the shape of the current courts imitate this design so that the ball can ricochet off in any direction from the buttresses that jut out from the walls. The best players use the erratic bounces off these angular surfaces to flummox their opponents, making for a fast-paced and unpredictable sport. There are also two levels to the court, with the front section built around six inches higher than the back section. Somewhat complicated to explain without seeing it, Wilkinson recommends experiencing it for yourself. As the sport extends its reach, with 40 courts in England and several more around the world, one of the best places to experience it surely remains in Cambridge. Around 30 University players convene at the sport centre at the West Cambridge Site to play each year, from beginners to national champions. Wilkinson reports that training “entails a mixture of drills and games (mostly games).” Because there is no dedicated coach, sessions are usually run by the most senior players, practicing particular kinds of shots and simulating certain match situations. This means that newcomers are lucky enough to play with and be developed by world-class players. Newbies will be thrown in in at the deep end, immediately pitted against the likes of Riki Houlden, president of the Cambridge University Eton Fives Club and winner of several national tournaments – he even took part in the prestigious finals of the Kinnaird, described as the “ultimate goal” of any player and the pinnacle of Fives competition. But he is a considerate teacher: “I remember one of my first training sessions where I partnered Riki for a game, little did I know at that point how good he really was, which I think embodies the ethos of the community and the style of training that we have,” says Wilkinson. But just as important as training are the games, interspersed throughout the year. Teams from all over the country visit Cambridge for their impressive Fives facilities, with a team from Canada a recent example. Cambridge University teams also travel all over the country to play, including, this year, to compete against universities from far and wide in the inaugural London Varsity. The team goes to “national tournaments across the country”, including at Britain’s two most revered schools, Eton and Harrow. Wilkinson sees this as an added opportunity to “develop your Fives craft through a full day of Fives and an exciting way to escape the bubble.” The sport is also a half blue sport with the possibility of achieving full blue status upon reaching a certain level of achievement. The all-important Varsity match, running since 1928, is played annually at Eton. 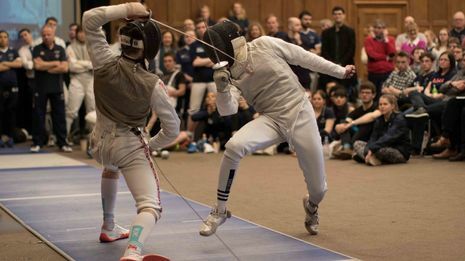 Six men’s pairs and six women’s pairs face off against their respectively ranked opponents with the top three pairs after five games receiving “a coveted bottle of Pol Roger” for their efforts. Excitingly niche yet growing rapidly in popularity, anybody who plays Eton Fives is invariably hooked by the quick-fire gameplay and challengingly-novel court as well as its rich history. And fortunately, it is easy to get involved. “Readers are more than welcome to turn up at any point during this time, however we will also be looking to organise taster sessions at the more accessible Magdalene courts and also some at the West Cambridge Site in the weeks following Freshers week.” So, if your sporting life is at sixes and sevens, why not try Fives?